The annual Back to School Fair at our Larkins Early Learning Communities (ELC) served about 450 children and adults who came to collect the free school supplies and enjoy the activities designed to promote learning, motor skills, creativity, and healthy living. The fair took place on Wednesday afternoon this week. The school supplies were purchased and donated by the Emerging Philanthropists, a group of young leaders organized through the United Way for Southeastern Michigan. Members of the group came to the Larkins ELC the Saturday before the fair and filled 200 backpacks with school supplies. Those backpacks were given away on a first come, first serve basis. 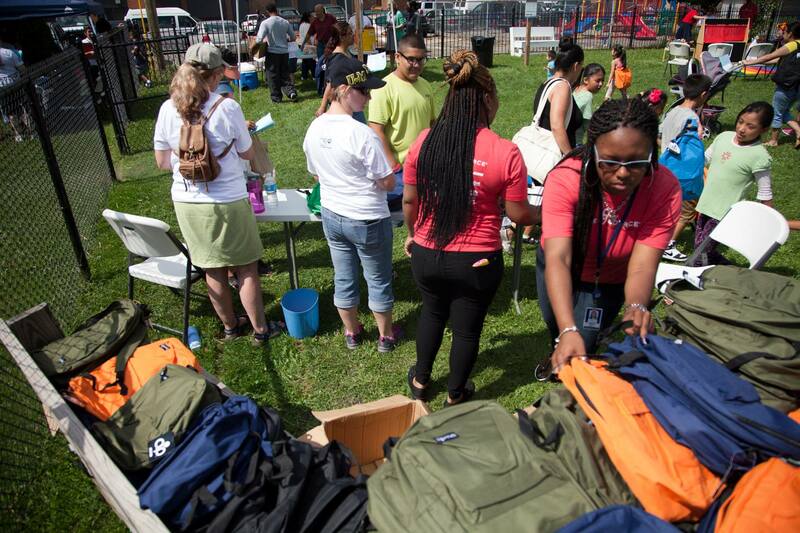 Once they were gone, children received other school supply items. All children attending the fair had the opportunity to receive a new book that they could choose themselves. More than 25 volunteers helped at the fair, representing Chrysler, PwC (PricewaterhouseCoopers), Quicken Loans, Title Source, and the United Way. In total, 331 children participated in the event.